Wedge Anchors / fasteners are designed to be used in solid concrete or grout-filled concrete masonry. They are also called concrete bolts, concrete stud anchors, stud anchors and wedge bolts. For all of your Wedge Anchors needs please click here for a Quote or call us today! 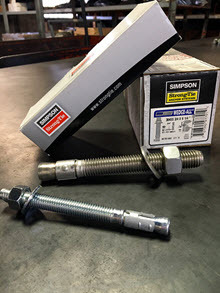 Specializing in Simpson Strong-Tie Anchor anchoring and fastening products including wedge anchors, adhesives for anchoring and crack injection, mechanical anchors, powder-actuated fasteners, gas-actuated concrete nailer and drill bits.